The soybean cyst nematode, one of the crop's most destructive pests, isn't like most of its wormy relatives. Whereas the vast majority of nematodes look like the microscopic worms they are, the female soybean cyst nematode shape-shifts into a tiny lemon after feeding on soybean roots. In a new EvoDevo article, a University of Illinois research team explains how it happens and why. "We think the soybean cyst nematode has evolved this body shape so that they can produce a lot more offspring," says Nathan Schroeder, assistant professor in the Department of Crop Sciences at the University of Illinois and corresponding author on the new study. "If you compare the most closely related species that stay long and skinny, they have a lot fewer babies than this lady does." The round shape allows female soybean cyst nematodes to retain about two-thirds of their fertilized eggs inside their bodies. As embryos develop, the mother's body hardens to become a protective cyst. Schroeder says these adaptations have allowed the soybean cyst nematode to become as successful as it is. "Normally, there's one division for each molt, creating one new set of nuclei in the multinucleated epidermis. We found that with soybean cyst nematode, they divide multiple times after infection, molt, divide even more times, molt, divide even more times. You have exponential growth which leads to this fat, round beast that has lots and lots of these epidermal nuclei," Schroeder explains. "Between the last juvenile phase, which is long and skinny, and the reproductive adult phase, the number of nuclei increase forty-fold." "The larger question is how do you get new body shapes in biology? How do new shapes arise? 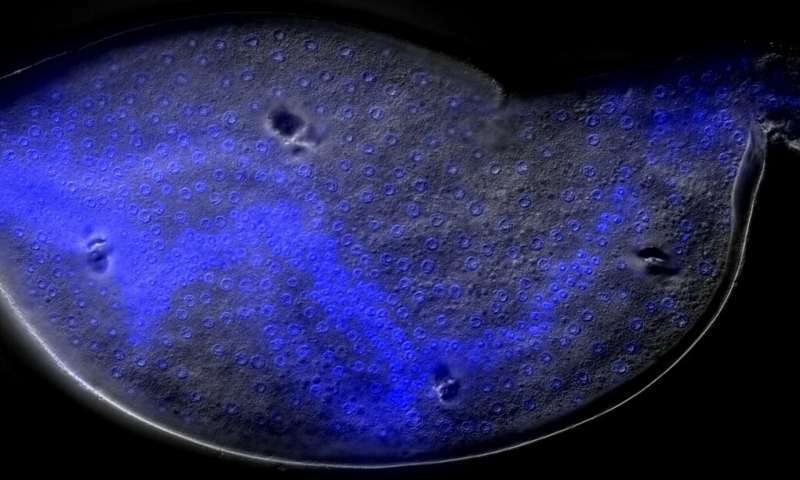 In this case, we're suggesting that these organisms are using mechanisms of stem cell proliferation to generate new body shapes, which is pretty interesting," Schroeder says. "From my perspective, it's a combination of interesting biology and practical implications with an economically important pest causing yield loss throughout the Midwest," Schroeder says. "If we can find some new target strategies that will affect it but not the other thousands of beneficial nematode species in the soil, that would be a game-changer."